"It was a very trying year, ladies. My drama department was invaded by outsiders, singers coming from the chemistry lab and locker room. Shocking, really." "It's summer, Ryan. Everything changes." "My life is over. I've been a good girl... I've never lied... Except when necessary. I've always bought my parents expensive gifts... Using their credit cards, of course!" "Sis, we've got the pool, the entire club, and the whole summer to enjoy it." "Troy, I think it's time you met my parents... Mommy..."
"You're a good guy, Troy. And actually, right now, I think I like you better than I like myself." (After hearing about the staff not being allowed to perform in the talent show, Gabriella confronts Sharpay.) Gabriella: Sharpay! (pause) Forget about the rest of us, how about the fact that your brother has worked extremely hard on this show? Sharpay: Oh boo-who, he'll be in the show, he'll do his celebrity impersonations. And don't you lecture me about Ryan, given the way you've been interfering with Troy's future. Sharpay: You've gotten him written up by Fulton for sneaking on the golf course and swimming after hours. I had to step in just to save Troy's job. Gabriella: I'm not interested in what you think you're doing for Troy, that's between you and him. But you're messing with my friends and my summer, and that's not okay with me. Sharpay: You don't like the fact that I won. Gabriella: What's the prize? Troy? (Troy walks up behind Gabriella and hears the rest) The Star Dazzle Award? You have to go through all this just to get either one? No, thanks Sharpay. You're very good at a game that I don't want to play. So, I'm done here. But you better step away from the mirror long enough to check the damage that will always be right behind you! Sharpay: (upset and mad) GIRLS!! 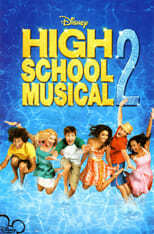 (Sharpay walks off and as Gabriella goes to walk away, Troy runs up.) Troy: Hey! What do you mean you're done here? You can't quit! Gabriella: Us working together sounded good but plans change and...people change. The club talent show is a big deal for Sharpay and evidently for your future, so it's cool, just make it happen; wear your new Italian shoes. Gabriella: Blowing off your friends? Missing dates?! If that's you, it's good to know! Troy: No, no, no, no, no. I was only doing that because I'm working on the scholarship thing.You know that. Gabriella: (sighs) But if along the way you act like someone you're not, pretty soon that's who you become. (very stressed, about to cry.) "Give me a beat!" Running gag: Whenever Troy and Gabriella are about to kiss on camera, something or someone interrupts them. In the next-to-last scene they kiss even though they are interrupted by the sprinklers. Martha Cox: Hi Kelsi! What are you planning on doing this summer? Kelsi: Grow... Write music... Grow! Ms. Darbus: You must remember, young thespians, learning is never seasonal, so do allow the shimmering lights of summer-- (All gasp due to the exclamation tone used by Ms. Darbus)-- to refresh and illuminate your fertile young minds! Chad Danforth: (Whispers) What is she talking about? Chad Danforth: Dude! You're actually listening? Ryan: Listen, I know that everybody think I'm Sharpay's poodle, but..
Gabriella: Hey! If anyone thinks that, they're not thinking that today. Sharpay Evans: Oh don't you mention that backstabbing yoginni to me! If you can't fire them, make them want to quit! Sharpay Evans: Ryan, who is East High's primo boy? Ryan Evans: Um, I think Troy Bolton has the category pretty well covered. Sharpay Evans: Right. And who is East High's most primo girl? Sharpay Evans: Exactly! Troy. Sharpay. Sharpay. Troy. It just makes sense!